Cerebral Palsy is a neurological disorder caused by damage to the brain of a fetus or infant during brain development. Cerebral Palsy affects the patient’s motor function, including movement, balance, coordination and posture. Cerebral Palsy can range from extremely severe to extremely mild, depending on the extent of the damage and the area of the brain that was damaged. While the damage to the brain that causes Cerebral Palsy neither improves nor worsens with time, it is possible that the symptoms of a person with Cerebral Palsy will change as the person ages. Spastic: Between 70% and 80% of Cerebral Palsy cases fall into this category. The patient suffers from an increase in muscle tone, which can be seen in rigid limbs, and jerky movements. This is also known as Pyramidal Cerebral Palsy; this name refers to the area of the brain that is damaged in order to cause these symptoms. Choreoathetoid means the patient makes irregular movements, but they are more sinuous or twisting in nature. Mixed: It is possible for one individual to have more than one type of Cerebral Palsy, particularly if more than one area of the brain was damaged. Most commonly, these individuals will have spastic symptoms in one limb and non-spastic symptoms in another limb, but any combination of symptoms is possible. 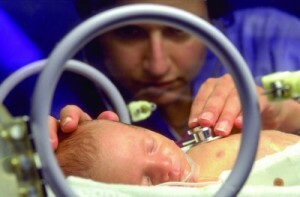 Mixed Cerebral Palsy may account for up to 10% of Cerebral Palsy cases.